It’s Monday again, and I’ve got a plan for our menu. Last week we had a few more leftovers than I anticipated, so there are a couple of carry overs on our menu this week. The creamy mexican casserole that we tried last week was very good. I used a pound of ground beef instead of the chicken called for in the recipe and it worked out well (although it would probably be just as good with only a half pound of beef). If you like things spicy you probably want to add some ground cayenne pepper in with the spices; Matt and I added hot salsa to our servings so that the casserole wouldn’t be too spicy for the kids. This would make a great potluck or party dish, too, since it can be eaten with tortilla chips. Anyway, here’s what’s on our menu this week. I’ve been craving buffalo chicken dip for a few weeks now, so I might make a dish this week and throw it in there somewhere. And, of course, I’ll be making several loaves of bread (thanks to my handy, dandy bread machine) including a couple of new recipes (hopefully). That’s my plan for the week. 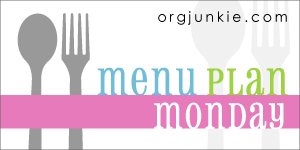 For more meal and menu plan ideas hop over to Menu Plan Monday at orgjunkie.com and see what everyone else is eating this week. Little (deadpan): Jesus and God. There are a lot of toes. Me (to Matt): Little told me today that I am a princess. Little: I was just pretending! Yep, never a dull moment around here. A used bookstore would be an option since we don’t have a good one in our area, but the only real business idea I’ve had is for Lindsey and me to open a stroller and baby carrier “rental” company where new moms and moms-to-be could try out different kinds of carriers and strollers without having to make the financial investment that is generally involved in these purchases. We would also rent carriers and strollers for people who were traveling or only needed them for a short time for whatever reason. Our husbands laugh anytime we bring it up. Right now I’m perfectly happy as a stay-at-home mom. At some point in the future, however, I would love to train as a lactation consultant or doula (or possibly both). I have no idea. Can’t say that I’ve ever really thought about it. Absolutely, positively, no doubt about it, it would be a maid! I’m good with cooking, laundry, shopping, etc, but I cannot stay on top of cleaning these days (could, just possibly, have something to do with having a newborn, but still) and it’s not something I enjoy most any time. If I had the money, this would definitely be baby carriers, as it stands right now, I’ve gotta say cloth diapers. I would love to be smart enough to be on Jeopardy. ooo…I don’t know. Probably either Jo in Little Women or Elizabeth Bennett in the BBC Pride & Prejudice. I think I’m enough like both of those characters to pull it off (if I could act). I’ve never made a bucket list, but I would like to buy a house 100% cash down (which would only happen if we were totally debt free), see my children find their God-given purpose in life, travel Europe with Matt, move back to East TN or western NC, and drive an Audi TT turbo (6 speed manual transmission and convertible would be nice). Wow, that was much harder than I thought it would be. I can’t remember very many of my individual birthdays, but my 19th birthday is definitely pretty high on the list. That year my Mom, brother, sister-in-law, and oldest nephew (who was 9 months old at the time) came to Montgomery (where I was in college) to celebrate with me. It was the first time my family met Matt. I’m running a little behind here, but better late than never. Right? I have several new recipes on the menu this week, so hopefully it will be a tasty week around here. I did make the broccoli cheese soup Saturday night, and, although things got a bit stressful at the end when the soup was thickening and the baby was hungry, it was very tasty. The onion was a bit strong for my taste, so next time we’ll cut it drastically or leave it out all together. For meal and menu plan inspiration visit Menu Plan Monday at orgjunkie.com. On Monday morning, January 11, I was awakened about 5 a.m. by contractions that steadily grew stronger and closer together. I was 40 weeks 3 days pregnant, so we were anxiously awaiting the arrival of our newest baby girl. 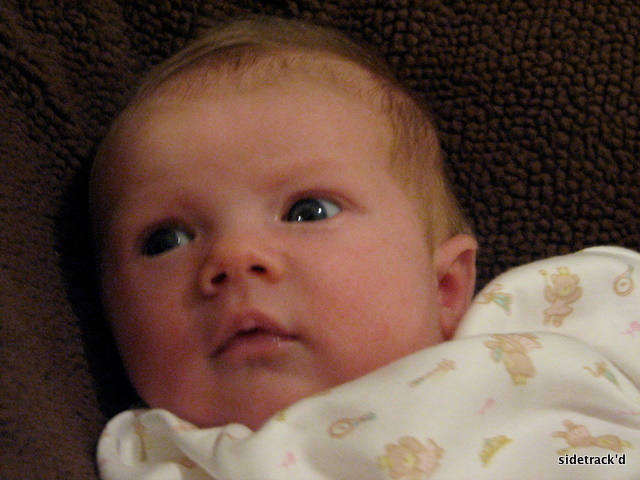 Our precious baby girl was born that afternoon and immediately stole our hearts, just as her older sister (3 1/2 years old) and brother (21 months old) had upon their births. My parents made the three hour trip from Nashville to be with our older children while I was in the hospital. The news they brought of Mema seemed to be good; everyone thought she was improving and that with time and a change in medication she would be able to go home. The next twelve days were pretty much a blur of newborn care, mom recovery, tending to the older children, and attempting to get as much sleep as possible. And then, on Saturday, January 23, my whole world shifted as I learned that my Mema had left this earth and gone to be with Jesus. As I spoke with my Mom on the phone that morning, I struggled with many things: holding back the tears well enough to carry on a conversation, guilt at not having been able to visit Mema in the last few months, and a profound sadness that my tiny baby had not been able to meet her great-grandmother. I immediately made the decision that I had to be at the funeral; there was just no way that I could miss it. Even though that meant loading up all the little people, making the three hour trip, and exposing my two week old baby to all of the people who would be coming and going during the visitation and funeral. For me, this was really a no brainer, the choice between the temporary hardships of a 24 hour trip to Nashville or a lifetime of regret for not being there. Mema was a very special lady. She poured her love into my life from my very earliest moments. She set an amazing example of what a wife should be as she cared for my grandfather during his years of battling muscular dystrophy. She demonstrated the love of a grandmother in every way. She influenced my life in many ways. Her death is felt by many and by me every day. Our baby girl is a very special little lady. Right now because she is ours and, hopefully, in years to come because she grows and matures into the very special lady God has created her to be. I feel blessed to be her mother and pray that she is as good a woman as my Mema was. I did get to introduce these two ladies who mean so much to me, although not in the way I had hoped. Instead of a cheerful welcome into the arms of her great-grandmother it was a tearful, one-sided conversation. And now it is my privilege and obligation to make sure that this tiny girl knows how much her Mema loved her even though she never met her. It is my privilege and obligation to make sure she knows that in her final days Mema was very concerned about the well being of this tiny girl. It is my privilege and obligation to make sure that I pass along the legacy that Mema left. Mema, you are loved and missed, but a part of you lives on in each of your daughters, granddaughters, and great-granddaughters. Including this tiny bundle of baby girl that I hold in my arms. …I nurse like a champ. …sometimes I go four hours between feedings & sometimes just an hour & a half. …I alternate between good and bad nights (good night/bad night, rinse, repeat). …mommy and daddy wish I’d get a little more consistent at night. 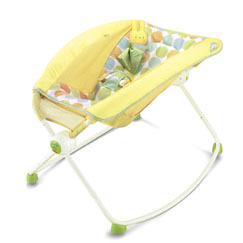 …I like to hang out in the swing and my new Rock ‘n Play Sleeper. …my big sister and big brother love me very much. …sometimes my brother loves me a little too much…and a little too aggressively. …I love being worn – in either the ring sling or wrap. …I’m very alert when I’m awake and usually pretty content (if I’m being held). …my mommy and daddy love me very, very much! I know there are a few of you anxiously (or not) awaiting an update post on baby girl. Sorry, but you’re going to have to wait a bit longer for a couple of reasons: 1) I want to post this first, and 2) we have to take some pictures of the baby. Poor thing is seriously going to have third child syndrome; she’ll be a month old tomorrow and the only pictures we have of her are the ones we took in the hospital. Yes, I do feel Mommy guilt, so let’s move on. Little is all about snow this winter. She talks about snow, asks when it is going to snow, and plots the things she will do when she finally gets to play in the snow. Little: Mom, can I play in the snow? Me: Little, there really isn’t enough snow to play in. Little: Can I make a snowman? Me: No, baby, there isn’t enough snow. Little: Can I make a snow angel? Me: Sorry, sweetheart, there isn’t enough snow. Little: Well, can I at least make a footprint? Fortunately, there was enough snow for her to make some footprints. So, that was our first encounter with snow this year. Then, a couple of weeks ago, the weather people started forecasting a big snow headed our way. We were supposed to get 6-8 inches, and everyone was very excited (and very anxious to get to the grocery for bread and milk). This is the South, people! There was enough for the little people to go out and play, which they loved. 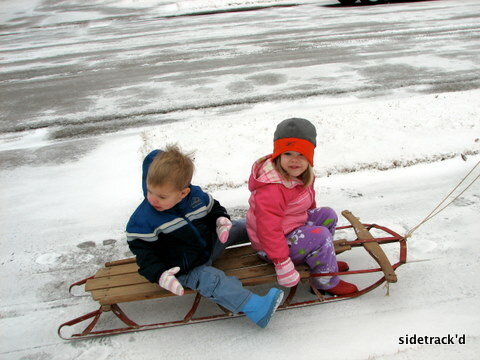 And the next day the ice made it perfect for sledding. They loved this too! Little was much more impressed with this snow, but since it was mostly ice it posed challenges of its own. She couldn’t make a snow angel because she couldn’t push her arms down hard enough to break through the ice crust. And poor Boo had trouble walking in it. Just about every time he took a step he lost his balance as his foot broke through the ice crust and fell on his bucket. I so wish I had been filming him when he first went out; he stepped over the transition point between our concrete patio and the grass, lost his balance, and went sprawling face forward into the snow. It was hilarious! That was the first of our two snows in a week and a half span. I’ll post about this week’s snow soon. 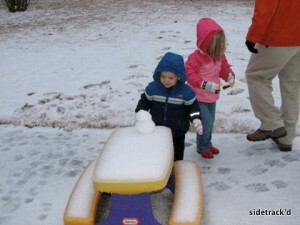 You are currently browsing the Sidetrack'd weblog archives for February 2010.